The Bible reveals that Arabs came to faith on the day of Pentecost when they heard Peter’s preaching in their own language (Acts 2:11). From that time until now, there have been Arab Christians who call upon the name of “Allah” to describe the God of the Bible, the God of Abraham. But in the 7th century Muhammad came on the scene and he too used the word “Allah” to describe the deity. Shall we stop using the word, which has been historically used by the Christian Arabs since the beginning, simply because Muhammad, a non-Christian, has used it as well? The litmus test is that God is the Father of Jesus Christ, and the God who IS Jesus Christ! From John’s daring use of “Logos and Theos” we learned the principle of allowing foreigners (as the Greeks were foreigners to John) to use the familiar term for the deity. For example, when evangelists from Latin Rome crossed the Rhine River and met the Germanic people, the believers asked, “What do you call the high and lifted up one who created the world out of nothing?” “We call him Gott,” they replied. “Gott,” repeated the church workers. “We have good news for you,” the evangelists preached, “The one you call ‘Gott’ became flesh and dwelt among us.” And so the gospel came to the Germanic peoples like that. Always we have gone back to the Bible for correction and reproof, to passages like the Pentecost event and John 1 to get our bearings and to be biblical in our witnessing methods. That is how we who speak a Germanic language (Anglo-Saxon) were allowed to call him “God.” Tens of millions of Kurds, Persians and Urdu speakers call Him “Xhoda.” Let’s be biblical first and always. We who have faith in the God of the Bible do not mean by “Allah” the same thing that Muslims believe or that the Qur’an teaches. When someone asks, “Is Allah the same as God?” it requires a pretty careful, thorough discussion, as you can see here. The only way that “Allah” can be “God” is if both of these identities refer to the Yahweh revealed in the Bible—the God of the burning bush, of the Exodus, of the Psalms, of the prophets, the God who is the Father of Jesus Christ, and the God who IS Jesus Christ. For millions of Arab Christians, the God of the Bible is the Allah of the Bible. Bob, I heard someone say, “Muslims have God, they just need Jesus”. This did not sit well with me because I do not believe that the Allah represented in the Qur’an is the Yahweh represented in the Bible. Thank you for helping me understand that Arab Christians use the name Allah for Yahweh and affirming that it is a misunderstanding that the Qur’anic Allah is equal to the Biblical Allah. On every page of the Bible God reveals Himself to be Holy, Just, Merciiful, Compassionate. All these characterstics are said to be shared by the Allah of the Qur’an as well. However, Mohammad ends the Qur’an with the sura that says “God has no son,” sort of like Mohammad’s famous last words (sura 112:3). This is the Qur’anic verse written on the outer wall of the mosque at the Dome of the Rock in Jerusalem, the verse facing the Church of the Holy Sepulchre. Thus, the Qur’an defines itself as irreconcilable with the revelation of the Bible. Jesus Christ understanding of Himself is this: “The works that the Father has given me to accomplish, the very works that I am doing, bear witness about me that the Father has sent me. And the Father who sent me has himself borne witness about me. His voice you have never heard, his form you have never seen, and you do not have his word abiding in you, for you do not believe the one whom he has sent. You search the Scriptures because you think that in them you have eternal life; and it is they that bear witness about me, yet you refuse to come to me that you may have life.” John 5:36-40. For a Muslim to profess his “love for Jesus” or for anyone to love Jesus while remaking Jesus into someone less than God’s only-begotten Son is merely a sentimental, moist-eyed, imaginative denial of Jesus’ revelation of his divine nature. Lamin Sanneh, Ph.D. at Yale University has suggested a way to speak of the God of the Bible to Muslims that makes the difference clear. Lamin Sanneh, who grew up a Muslim in the Gambia but is now a Christian, dedicated his book “Translating the Message” “Whose Religion is Christianity?”to his mother, a Muslim who died, he said, “without hope and without an advocate.”” ” without hope and without an ally. This is a daring but accurate restatement of Paul’s words in Ephesians 2:12–“Remember that you were at that time separated form Christ, alienated from the commonwealth of Israel and strangers to the covenants of promise, having no hope and without God in the world.” The genius behind Sanneh’s restatement is that Muslims are without “an advocate,” that is, they are without the joyous knowledge of a God who keeps His promises to mortals and sinners. “If anyone sins, we have an advocate with the Father, Jesus Christ the Righteous!” (1 John 2:2). There is nothing remotely like this in the Qur’an or in Islam; in fact, quite the opposite. The “greatness” of Allah is his unapproachability, his estrangement from humanity. In the afterlife Allah does not show up in Islam’s so-called paradise. How could he? He is unknowable, and this unknowability is Allah’s glory in Islam. Now we run to the Bible to hear Isaiah say, “Can a woman forget her nursing child, that she should have not compassion on the son of her womb? Even these may forget, yet I will not forget you. Behold, I have engraved you on the palms of my hands” (Isaiah 49:15); and we run to hear Jesus Christ say, “In my Father’s house are many rooms; if it were not so would I have told you that I go to preapre a palce for you? And if I go and preapre a place for you, I will come again and will take you to myself, that where I am you may be also” (John 14:2-3). When we know the glory of God in the face of Jesus Christ (2 Corinthians 4:6) we will desire to meditate on the God of the Bible day and night. 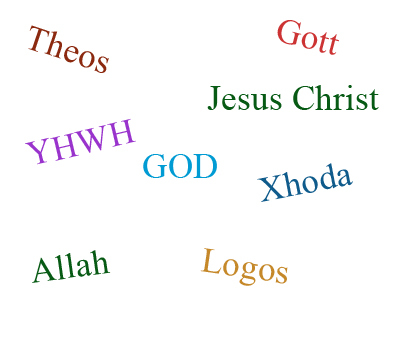 It is my personal belief that we can and should use “allah” to reach the Muslim about Christ and Yahweh, but the Bible does say that God’s name is “I AM”. Therefore, I believe that once a person has changed their perspective and come to the saving knowledge of Jesus the Christ, then they must use the One name by which we are saved. “allah” is translated to mean “the god”, which technically could mean any divine entity whether the real God or a made-up one, it is very much similar to the word we use in English for “God”, we capitalize it to mean a proper name, and leave it lower case for other deities, but just like with “allah” that can lead to confusion. Therefore, whenever we have a saving knowledge of the “god” Yahweh that created and sanctified us, I believe we should stop using the term that Arabs/Muslims have taken to mean the name of their own deity, so as to stop confusing the issue, and prevent others from thinking that “allah” had a son named Jesus. He did not, it was Yahweh.